The International Monetary Fund's upgrade to the Chinese growth outlook for 2019 this week is a validation of the soft-landing of the economy amid prevailing trade tensions. This comes as macro policy in China has been geared towards preventing a significant growth slowdown. China's GDP report for the first quarter of 2019 will be a testimony of this view next week. Other economic indicators including industrial production, fixed asset investment, and retail sales, for March - also due next week - are pointing to moderate GDP growth. 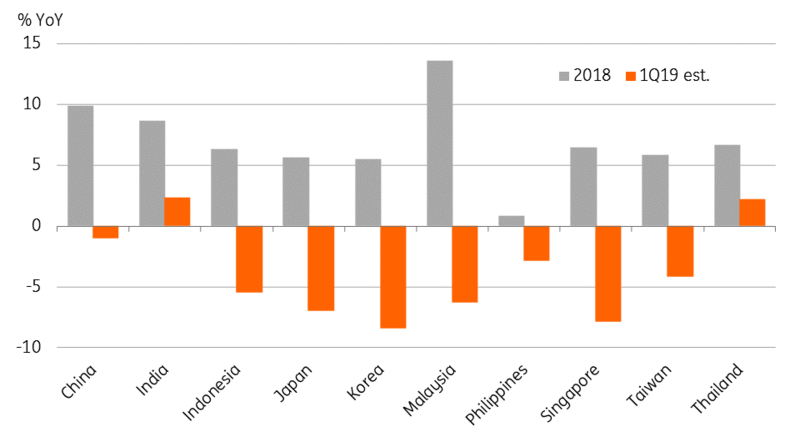 However, despite the higher tariffs in 2018, Chinese exports were by far Asia's outperformer with about 10% annual growth. Against this backdrop, some negative trade growth was inevitable. But so far there isn’t a whole lot negative, at least judging by the consensus trade forecast for March (data due on 12 April), which implies less than 2% contraction in both exports and imports from a year ago. As such, we consider our forecast of 6.2% GDP growth in 1Q19 at risk of an upside surprise. The consensus estimate is 6.3%. 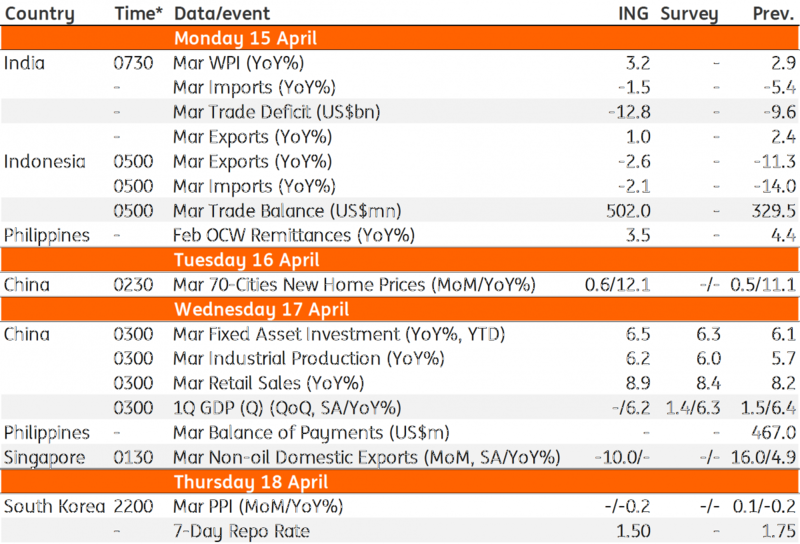 1Q19 actual data for Korea and Taiwan, ING's estimate for the other countries yet to release March figures. We may be an outlier in our forecast of a Bank of Korea policy rate cut next week, especially just months after a 25 basis point hike in November. The factors underlying our view are accelerated export weakness depressing GDP growth and low inflation opening the doors for policy support for the economy via lower interest rates. 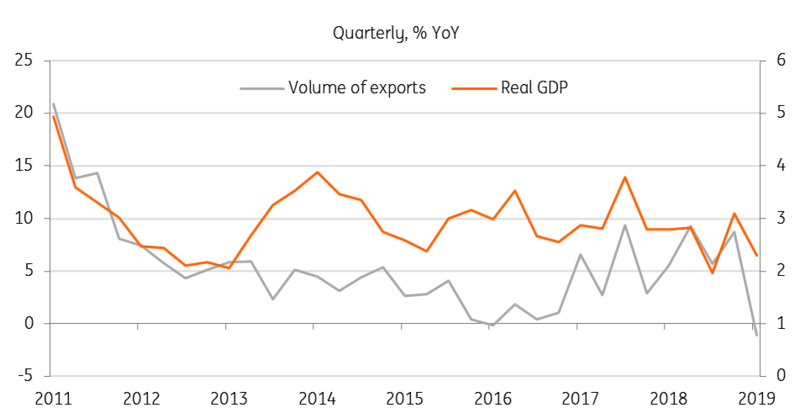 Over 8% fall in exports in 1Q19 from a year ago was probably the worse among Asian countries. Undoubtedly, it should have caused a dent to GDP growth from 3.1% posted in 4Q18 (ING forecast is 2.3% for 1Q19, data due 25 April). The central bank also releases its quarterly economic outlook report on the same day as the policy meeting. We anticipate yet another downgrade to the central bank’s growth, and inflation forecasts – last cut in January puts GDP growth forecast at 2.6% and inflation at 1.4%. If so, it might as well cut the policy interest rate at the same time rather than waiting for the downtrend to intensify further. 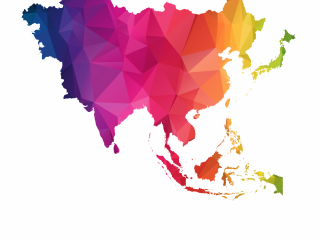 The week is also heavy on March trade figures from India, Indonesia Japan, and Singapore – all possibly pointing to greater downside growth risk to Asian economies. In view of high trade deficits, data from India and Indonesia will be closely watched as these economies and their respective currencies sway. A double-whammy of slowing exports and elevated imports owing to their strong domestic demand and rising fuel import bill with the higher oil prices point to no respite in the near term. Singapore’s export trends seems akin to Korea’s, both dragged down by the global technology slump and depressing GDP growth. 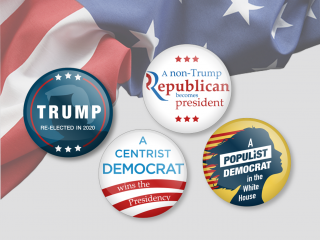 And alongside all of this, Asia's two most populous countries – India and Indonesia head to the polls.